The Red Wings are struggling and Jeff sorts it all out for us. When the Wings are doing OK, it makes Jeff happy, as well as a certain redhead (Ohai Doug!) from Hockey Town too. And when he’s happy, the pillow talk around here is more pleasant. Will may agree. 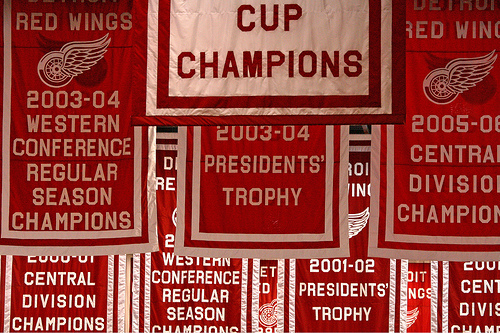 You can’t deny that stat: the 2007-08 season ended with Detroit bringing the Stanley Cup home. Still it’s been a tough couple of weeks in the land of the Red Wings. As we all know, the team started with perfection, a 5 game winning streak. That streak died a nasty death on October 22 with a devastating 7-1 loss to the Washington Capitals. That was just the start of the dark period as losses to Columbus (who the Wings had beaten just the day before the Capitals game), San Jose, Minnesota (once in a shootout and once in OT) and Calgary followed. 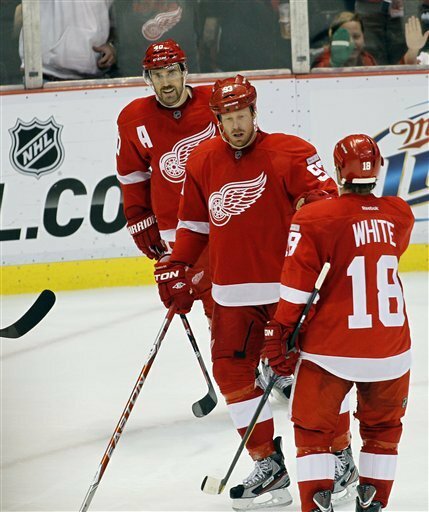 The Red Wings snapped the losing streak Saturday night by shutting out Anaheim 5-0. All of this has dropped the Red Wings into 10th place, wedged between Colorado and Vancouver, in the Western Conference. They’re tied in points, 13, with Vancouver. Yes, the season is only just begun, with most teams having played between 13 and 15 games out of the 82. However, this harkens back to what I wrote about in my first Red Wings post—the team’s inconsistent play is its biggest obstacle to success. This has been all too evident during these six games in which the Red Wings were missing all of their key components to greatness, especially their ability to shoot and score. Just look at the boys stats 12 games in. The guys we should be seeing the most out of: Franzen, Datsyuk, Filppula, Zetterberg, Kornwall, and Hulder have extremely low number of points. Frazen is tied with Lidstrom with 10 (both 5 goals/5 assists) and Hulder’s got only 4 (2 goals/2 assists). Compare this to the top of the NHL stats and you can see the hole in the Red Wings are in. Across 14 games, the top player is Toronto’s Phil Kessel has 10 goals and 11 assists for 21 points. 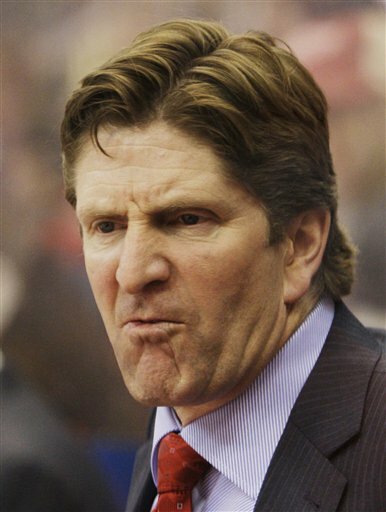 Meanwhile, the top Red Wing, Franzen, is ranked #60 on the NHL’s player’s stats. For a little perspective, Zetterberg finished last season #9 in the regular season stats with 80 games played, 24 goals and 56 assists. Top 10 is certainly where you expect to see members of the Wings given their skill level. Granted it doesn’t necessarily take a lot of goals to win a game. But Detroit’s defense and goal tending needs to get itself together. After shutting out Colorado on October 8, Ty Conklin was back in net for the Capitals game to let Jimmy Howard rest up. It was a disastrous game as he gave up seven goals. Conklin played again in Columbus and gave the Blue Jackets their first win of the season. 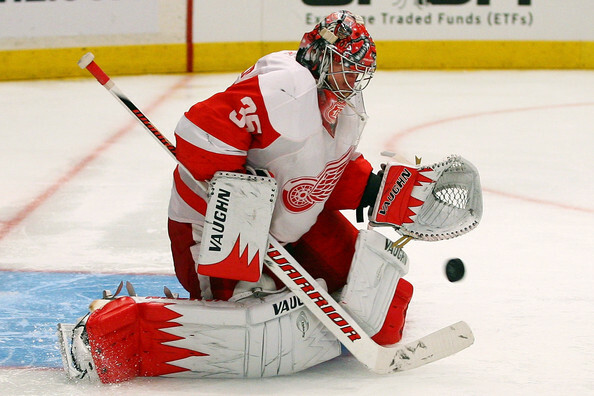 Of course, the goalie is a last line of defense, so that begs this question: Where is the Detroit defense? Nowhere was the question more valid than the second Minnesota game on November 1. The Wings scored in the first and held the 1-0 game until one minute to go in the third when the Wild’s Mikko Koivu got one past the D and Howard. It only got worse in OT when Franzen got a goalie interference penalty, which to me was a dicey call for the refs to make, and the Wild won on the subsequent power play. This game was the classic example of the Red Wings having, and then losing a lead. So where does this leave us now? The Wings are headed into a run that pits them against Colorado tomorrow night followed by Edmonton, Dallas, St. Louis, San Jose, L.A. and rematches against Anaheim and Calgary. That all leads up to a national TV match up against Stanley Cup defenders Boston on the day after Thanksgiving (NBC at 1pm ET). To say that I’m concerned is an understatement. To have goal scorers that aren’t scoring, defenders who aren’t defending and goalies who aren’t making saves is a recipe for bad hockey—just ask Columbus which only has 2 wins to its credit. Looking at this coming week’s games. The Avs are in the same spot as Detroit and will certainly be looking for a win to bolster their record. I do think this game goes to Detroit as they will be back on their game after Saturday’s shutout. Edmonton stands at 8-3-2 and will face Montreal and Boston before the Red Wings. Their season is full of close games and two shut out wins so this will likely be a dangerous game for the Wings. The guys will have to be at their best to get this win. Dallas leads the West, winning 10 of 13, and I frankly expect them to win against Detroit unless something radical changes in the Wings game play. What happens between here and Thanksgiving depends on if Mike Babcock and the team find the right on ice recipe to clean up the problems that sent them from perfect to a 6-5-1 record. It would certainly be a great Thanksgiving gift for the boys in red to win the majority of the nine games leading into the battle against Boston. This entry was posted in Detroit Red Wings and tagged Detroit Red Wings, Henrik Zetterberg, Hockey Town, Johan Franzen, Pillow talk, They sure have a crapload of banners, Ty Conklin. Bookmark the permalink.